As your Arlington Heights dentist, we pride ourselves on using the most up-to-date technology available. This allows us to provide our patients with efficient care and to make the most of your time in the dental chair. 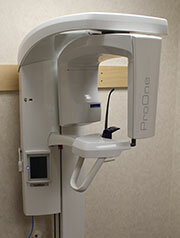 Your Arlington Heights dental office uses digital X-rays and digital panoramic X-rays. These X-rays emit up to 90% less radiation than traditional X-rays. There is also no sharp, painful film to put in your mouth, leaving you more comfortable throughout the process. Because no chemical processing is required, we are able to view the images on our computer screen within seconds, and can share our findings with you immediately. Our intraoral camera is a vital tool for patient education. This camera allows us to show you exactly what we see in your mouth, meaning we can walk you through your diagnosis and treatment options and give clear, thorough explanations of procedures. The camera also lets us see into areas of the mouth that might otherwise be difficult to get to. Dr. Cheskis and the Arlington Dental Arts team uses Diagnodent® laser cavity detection to diagnose and treat decay in its earliest stages. This low intensity laser scans your teeth and measures fluorescence within the tooth structure to help us find cavities that might otherwise go undetected. Healthy teeth have little to no fluorescence, but teeth that are experiencing decay will have higher fluorescence levels. The data collected by the scanner lets us treat the affected area before the decay worsens, which means we’re able to preserve more of your healthy tooth structure. Using this comfortable detection method also enables us to monitor areas of concern without the need for repeated X-rays. Our team uses dental loupes to get a clearer view of your teeth and gums as we work. Loupes not only make patients more comfortable because we aren’t up close and personal, they also help us be more efficient as we work by letting us see those harder-to-reach areas of your mouth. This means your cleanings and exams will be more detailed, and your treatments more effective. Experience our difference. Schedule an appointment today! For your convenience, you can download our new patient forms, print them, and fill them out to expedite the paperwork at your first visit.